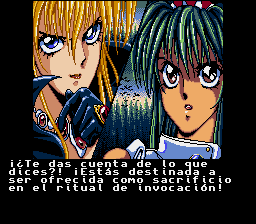 Released in 1991, El Viento is the first and best-regarded game in a trilogy (sometimes called the “Earnest Evans series”), with sequels on the Genesis/Mega Drive and Mega CD. In this fast-moving action-platformer you play as Annet, a young woman who, with the aid of her trusty boomerang and magic powers, is attempting to save the world from the evil demon Hastur. 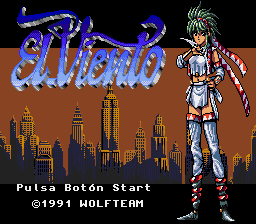 Like many Wolf Team games, El Viento is ambitious and sometimes sloppy. Set in the 1920s, the storyline offers up a bizarre mashup of H.P. Lovecraft, gangster culture, and American landmarks. If you’ve played other Wolf Team efforts on the Genesis, you’ll recognize the game’s visual style and sound design right away, with huge pixelated explosions that sound like whoopee cushions. 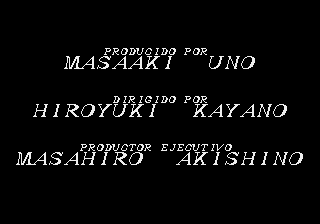 That said, El Viento is an uncommonly brisk and crisp game, with very smart level design and carefully tuned gameplay, and that makes it a pleasure to play. 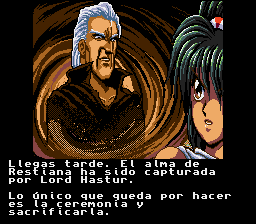 Only in the last stage, in which the player is pursued by incredibly irritating bats, does El Viento begin to deteriorate into more ordinary fare. Up to that point, it’s probably one of the best and smoothest action-platformers on the Genesis. Highly recommended. 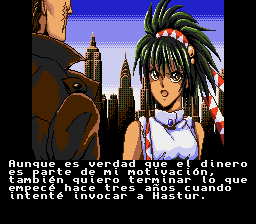 Translation to Spanish for “El Viento”, for the Sega Genesis/Mega Drive. Based on the enhancement by MIJET.